Mickey Morrison and Christian White, Haida Gwaii. The Haida are an ancient and powerful nation, internationally renowned for their artwork. Despite modern day assimilation, the Haida of Haida Gwaii are fiercely proud of their culture and history. Their stories of creation and transformation illustrate the richness of that culture. CBC Radio's Legends Project compiles traditional oral stories, legends and histories of Canada's Inuit and First Nations, gathered in communities across the country. 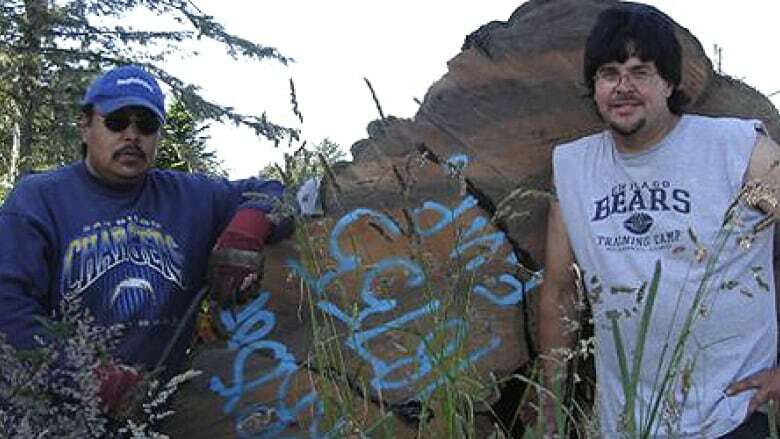 In July 2005 the people of Old Massett retold the ancient stories of creation, lessons and values for a preservation project by CBC Radio and the Haida Heritage and Repatriation Society. The team worked closely with the fluent speakers of Xaad kil to record these legends in their original oral form. People from Old Massett were chosen to read the parts of the mythical or ancient characters in this collection of five stories. The recordings were then mixed with the actual sounds - ravens, eagles, frogs, ocean, wind and rain - found on Haida Gwaii, also known as the Queen Charlotte Islands. The dramatizations of these Haida legends were recorded in the Dii tuulang naay Family Centre in Old Massett. This is the home of the Language Nest - a group of dedicated parents and elders, attempting to rejuvenate the Haida language for future generations. A grateful thank you to the National Aboriginal Achievement Foundation for its generous financial support of this community project and thank you to the Old Massett Village Council for these facilities. Haida Gwaii, also known as the Queen Charlottes, is a cluster of islands off the northwest coast of British Columbia. If you are Haida, you belong to either the Raven or the Eagle clan. The origins of these two clans are as ancient as the occupants of the islands themselves - more than ten thousands years of history. Many of the stories passed down through these generations are explanations of the clans, sub-clans and the crests that belong to each family group. In this small collection of dramatizations, two such stories explain the Grizzly Crest and the Killer Whale Crest. In spite of assimilation into modern politics and media, the Haida still strongly value the rules that have been associated with being Haida for these thousands of years. Even today, the Haida population shows proof of their robust health and pride in traditions. The Haida are active in protecting the natural resources of the islands and still enjoy a diet rich in salmon, halibut, Dungeness crab and berries from the land. The Haida are internationally renowned for their artwork as well as their tradition of carving sacred totem poles from the dwindling supply of giant old growth cedar. They are also known for their masterful skill of constructing huge cedar longhouses, where these stories were traditionally shared.